Menopause, just like puberty, is something that every woman goes through at certain age. 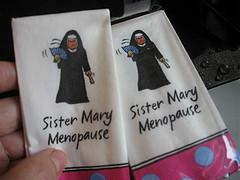 A lot of changes occur during menopause and some of them are not pleasant at all. In fact, some women find it quite difficult to deal with symptoms of menopause, even though they are perfectly normal and do not indicate any underlying problem. Some of the typical menopause symptoms are vaginal dryness, hot flashes, night sweats, skin problems, weight gain, irritability, depression, anxiety and others. Menopause symptoms are not the same for everyone. Some women hardly feel them at all while others have to seek help and relief, whether it is through natural remedies and lifestyle changes or through hormone replacement therapy. Hormone replacement therapy or HRP is used during or after menopause to restore some of the function that is lost after the balance of the hormones was disturbed with the onset of menopause. It can consist of estrogen alone or of a combination of estrogen and progesterone. These hormones are normally produced in the ovaries throughout a woman’s life. However, in menopause, the production of these hormones is reduced, which leads to a wide range of symptoms typical for menopause. Today, doctors prefer prescribing progesterone along with estrogen for women who still have their uterus. During the reproductive years, one of the roles of estrogen is to participate in the formation of endometrium, the lining of the uterine wall that is supposed to host a fertilized egg. When the reproductive period is over and there is no more shedding of the lining through menstruation, if there is too much estrogen it can cause an overgrowth of endometrium cells, which potentially leads to cancer. Progesterone, if taken with estrogen, prevents endometrial cancer by making the endometrium shed each month, much like a regular menstrual period. if these two hormones are taken simultaneously for an extended period of time, the bleeding will lessen and eventually stop. On the other hand, women who have had hysterectomy usually do not have to take progesterone along with estrogen. Even though HRT has been proved beneficial against typical symptoms of menopause, it is important to realize that there are some risks to it. Endometrial cancer, mentioned above is one of those risks. In addition, there is an increased risk of blood clotting and stroke, especially if a woman is already susceptible to those conditions. Several studies have also shown that hormone replacement therapy may increase the risk of heart disease in women.